It is the bright, long lasting annuals that create a spectacular spring and summer landscaping. Bring those bright spots onto your deck, patio, porch or apartment landing by including annual flowers in pots. All you need is some potting soil, attractive containers and a few stones for the bottom of the pot to help with water drainage. It is a simple project to transplant nursery annuals, however, you will want to consider if the plant requires complete sun or partial shade and how tall the annual will grow. This will help you decide where to place each potted annual. Thanks to hybrids (man-bred seeds), pansies can be found in a multitude of colors. The blooms last all summer long. They can grow up to 8 inches tall, depending on the variety. This annual can fill a pot nicely for locations that require only a short plant, such as a setting on deck railings or on side tables of patio furniture. Create a larger pot full of pansies surrounding a taller plant in the center. Be sure to remove dead blooms, so nutrients and moisture will go to the new flowers. Some of the most popular and common varieties of pansies are: majestic giants, crystal bowl and crown. If you are looking for more unique varieties, try imperial antiques or jolly joker. Cosmos flowers can grow to a height of 1 to 4 feet, depending on the variety. This is the perfect annual for the focal point of a mixed pot or all by itself. It requires a full-sun location. It blooms from late spring all the way until the first frost. These showy flowers will attract butterflies, as an added bonus. Cosmos grows in colors of pink, red, white, and bicolored, with yellow centers. It has spiky, almost fern-like leaves. Choose from dwarf to tall varieties, according to your needs. There is nothing more striking than a patio or deck full of potted red geraniums. For a softer appearance choose them in white, pink or lilac. These blooms grow in clumps at the end of strong stems. The leaves are thick in a medium-green color. They are a perfect annual to fill containers. If desired, small alyssums (tiny white flowers) can be added to the bottom edges of the pot. Geraniums grow to a height of 1 to 2 feet. They prefer a medium amount of sunshine to partial shade. They can be considered perennials in the very warm southern states, where little or no frost appears in the climate. Do not overwater these lovelies, as they could contract edema, in which brown blisters appear on the leaves. 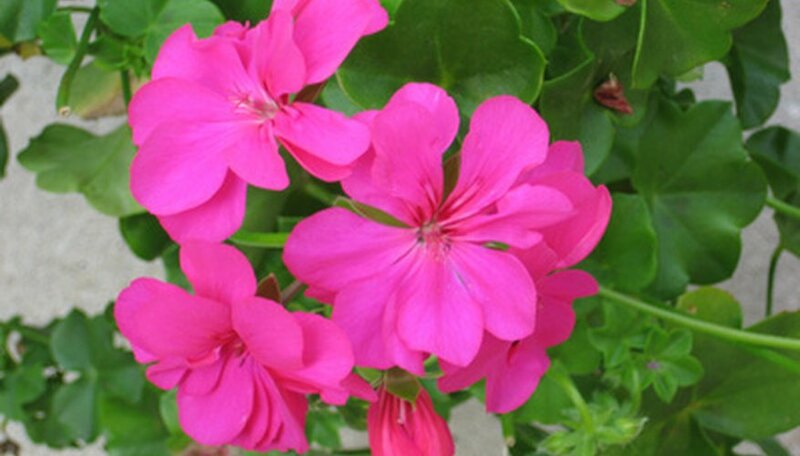 Geraniums look great and do well in regular containers, but also in hanging pots and window boxes. The lobelia flower is perfect as filler in annual pots. The tiny blue flowers should be planted around the edges, under larger annuals. It can be considered a perennial in the most southern, warm states but for the rest of the country they are annuals, dying off with the first frost of fall or winter. They grow only 4 to 6 inches tall, before trailing down to longer growth. They prefer a lot of sunshine, but will do well in partial shade also. Lobelia is perfect for hanging containers as well as in regular, standing pots.